Glasdon Ireland serves a variety of customers from government departments and public utilities to retailers and private offices. Product quality and innovative design are the key to our success and has established us as a market leader in each of our street furniture product ranges. Such as our outdoor litter bins or indoor recycling bins. Product quality is an essential attribute of street furniture to ensure longevity and provide value for money. Which is why we aim to supply our customers with the highest quality of products that will stand the test of time. All Glasdon products are designed and tested for the toughest of environments to keep them performing regardless of external factors such as adverse weather or vandalism. Need help choosing a product? We have industry experts waiting to help on our fantastic Live Chat feature. 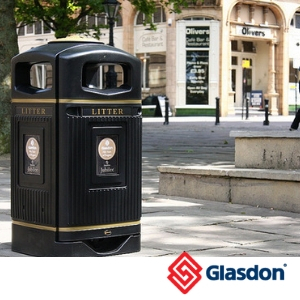 You can also take a look at our FAQs which will help to answer questions such as what fixings you might need for your litter bin or what materials do Glasdon use for their seats and benches?.